A diagnosis of Asperger’s Syndrome at just nine years old has not stopped Aaron Corbin winning the Intermediate Apprentice of the Year Award 2017. 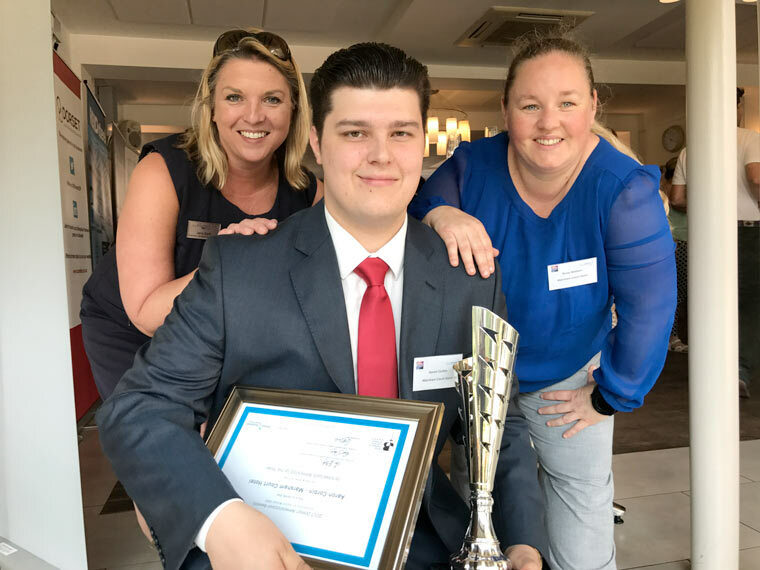 Aaron, now 20, from Canford Heath in Poole, was nominated for the award by his employers at the Marsham Court Hotel in Bournemouth and received it at the launch of the Dorset Business Awards at the Italian Villa, Compton Acres, on 6 July. Asperger’s can cause difficulties with social interaction, social communication and flexibility of thinking or imagination. It can also cause sensory, motor and organisational difficulties. Aaron first showed signs of being on the autistic spectrum as a toddler, but managed to complete a mainstream education at Carter Community College, Poole College and later at the South West Regional Assessment Centre (SWRAC), where he studied hospitality. The Marsham Court Hotel offered Aaron an apprenticeship in September 2016, after he was talent spotted by the hotel’s operations manager Nigel Reeve. Nigel explained, “Prior to my role at the hotel I was a Hospitality Tutor and Apprenticeship Assessor at SWRAC and had the pleasure of teaching Aaron. “I knew at the very moment of meeting him that there was something special about him. He had a deep interest and enthusiasm to learn. “As soon as he finished his hospitality course I offered him a job with an apprenticeship and agreed to become his mentor – and he hasn’t looked back. “Just six months after joining us he suggested that he should train any temporary staff coming in to work on the bar, to ensure continuity in the department. “He is a young man who has grown up with Asperger’s which can make it difficult for him to interact with others in a social atmosphere. The Marsham Court Hotel won the Business Engagement with Education award at the Dorset Business Awards 2016, for its commitment to working with young people. The hotel also offers work experience and permanent jobs to the long-term unemployed through the South West Regional Assessment Centre and is home to the CHI training school for young people with learning differences. Aaron said, “My apprenticeship with the Marsham Court has given me so much; a permanent contract and the stability that comes with it, plus valuable experience and a confidence in dealing with customers I thought I would never have. The Dorset Apprenticeship Awards 2017 were judged by Geoffrey Warde MBE, Ian Girling the Chief Executive of the Dorset Chamber of Commerce and Rod Davis the Chair of the Dorset and Somerset Training Provider Network.